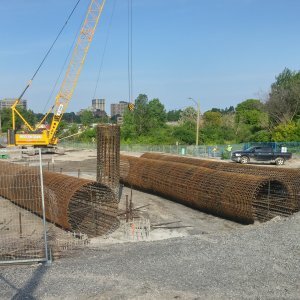 Why and When to Use Concrete Piles? Concrete piles can be either pre-cast pile, or cast in-situ. Concrete piles are generally reinforced. For pre-case piles, the reinforcement brings extra strength to resist bending moment during pile pick up, transportation, vertical loads, and bending moment as a result of lateral loads. They can be built in different sizes and shapes, as required for each specific use. Pre-case piles can be prestressed as well. Cast in-situ piles are made by drilling a hole into the soil, and then filling out with concrete. Cast in-situ piles can be divided into two main categories: cased, or uncased. Cased concrete piles are made by driving a steel casing into the soil. In this case, the mandrel is placed inside the casing. 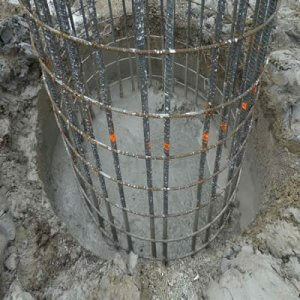 After reaching desired depth, the mandrel is withdrawn, and the casing is filled with concrete. In the case of the uncased piles, the casing will be gradually withdrawn. This entry was posted in Piles and Foundations and tagged Concrete, Concrete Pile, Piles. Bookmark the permalink. Piles are sometimes used to reduce superstructure settlement /differential settlement. You have not mentioned about micro piles used when foundation is near the existing structures. In this case Precast pile option not possible due to it may cause cracks on the existing structures but cast -in-situ bored piles with ground beam cantilevered is possible. It is possible to pile 1.2m away from existing structures. Very good comment. Thanks for clarification. The helical piers are very versatile for all applications and do not require concrete unless lateral load in less than 4 blow count materials, then a grouted pull down micro pile eliminates shaft buckling concerns in poor blow count material. Thanks for bringing up this topi. Found it very useful. In the case of piles 15 feet away from a structure… What is recommended alternative to impact pikes to prevent structure damage. Concrete piles are the most popular in application but now a days use of screw piles are also another alternative specially in sandy soil. Thanks for contributing to this post. It will help people in the design of these piles to know these tips. Chiclayo, the audience of rigid foundation is used in soft zone, necesiotandose paracumplir entire area of land with the solicitation of multistory building. What you say is very informative and useful, but I must say there is place for steel piles that I believe out perform concrete piles, especially when it comes to their flexibility needed in the newer double integral bridges being built now in New York State. Gary, I totally understand your point. I find your point valid. The reason it is missing, is because steel has never been main area of expertise. I may add another write up regarding steel piles, as I have seen may of them being used in jetty construction. Thanks for your comment. What is a screw pile? Are you talking about augured piles? This note on piles is quite brief. The type of pile used depends on the site conditions and availability of materials and techniques. some of these are proprietary techniques and would be available only if that particular contractor is chosen. Among cast in situ piles, there is driven cast in situ piles where a steel shoe is driven into the ground along with the casing and later the hole is filled up with concrete. The casing can either be left in place, or withdrawn depending on the site requirement. The compaction of soil in front of the shoe gives higher capacity for the same size of pile. There is also under reamed piles, which are generally used to resist uplift forces and also in black or yellow cotton soil to resist the shrinkage forces. Other than load bearing piles, there are also sheet piles and diaphragm walls to resist lateral forces, but that is another treatise. My brother recently found cracks in his foundation. He has been looking at options to secure his home. I didn’t realize that concrete piling can stabilize soils by filling large cylinders with concrete after drilling them. This could be a good option to help my brother with his home. It’s interesting to learn that when it comes to a construction site that there are a lot of uses for a concrete pile. The thing that you said that I find most interesting is that you pointed out that they should use them if there is poor quality in upper soil layers or it is expansive. Living in an area where construction is always constant, it’s good to know that there is a reason behind the things they do. We are happy that you found our article interesting. Please help us spread the knowledge around concrete piles by sharing this through your professional network. Thanks again and have a wonderful weekend. Thank you. Please feel free to share, We love to spread the word. I didn’t realize that concrete piles should be reinforced. I also like how you said that they could be any size or shape as well. My husband and I are looking into piling contractors; thanks for your post. It’s good to know that piling can be helpful when the quality of soil is poor. That can help add more support to the foundation of your home or building. I think I might want to add piles to the home I’m building.